This is a limited 3-day only sale that will expire at midnight on Sunday, February 27, 2011. Click here to buy now or for more information about the deal. Quantities are limited so don’t miss out! Limit 1 per person, may buy 3 additional as gifts. Limit 1 per visit. Reservation required; subject to availability. 24hr cancellation notice required. Non-transferable. Not valid with other offers. Make glorious music that makes inanimate objects jealous with today’s Groupon: for $87, you get a small-group introductory DJ course followed by one hour of practice time (a $175 value) at School of Remix on Dunlevy Street. A host of professional DJs armed with a suite of sound-shaping implements staff School of Remix, a mixing and scratching academy where fledgling DJs earn their wings. Turn fertile brainwaves into tuneful soundwaves with the aid of an hour-long introductory course in DJing, where knowing soundsmiths illustrate the principles of beat-matching, simple mixing concepts, proper use of equipment, and techniques to induce crowds to pump fists at the ceiling rather than your face. Professional DJs from Vancouver’s club scene lead School of Remix’s one-on-one sessions, where their encouragement and individual guidance sets neophytes on the path to party demigod-hood. 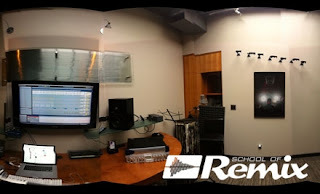 Students can use their home compu-portals to view the School of Remix studios, where they may someday raise lost beats from the grave and commune with the ghosts of mixes past. School of Remix also employs one of the only living humans certified to teach Ableton music software in Western Canada, who passes on his knowledge only to those who prove their valour in singles tennis. This is a limited 2-day only sale that will expire at midnight on Friday, February 25, 2011. Click here to buy now or for more information about the deal. Quantities are limited so don’t miss out! Limit 2 per person., may buy 1 additional as a gift. $3 surcharge required for 3-D films. No cash back. Not valid with other offers. 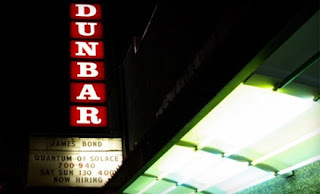 Take in the action on the screen with today’s Groupon: for $19, you get four movie tickets (up to a $43 value) for showings at Dunbar Theatre in Dunbar. Boasting top-notch projection technology and a new screen, Dunbar Theatre projects ribbons of celluloid dreams to transport audiences to swordfights in enchanted castles and quiet arguments in space libraries. Combining classic cinema accents with modern equipment, Dunbar Theatre features a balcony and rows of comfy theatre seats with ample legroom, as well as pull-up armrests for snuggling or hand-holding during suspenseful 3-D dentistry scenes. A friendly staff of concession technicians pops delicious kernels into fluffy, buttery buckets of popcorn for moviegoers to enjoy during the show. This Groupon may be used for one movie with three friends or over multiple solo cinema visits. An additional charge applies to movies projected in 3-D ($3). Call the Dunbar Theatre to check out show times, and arrive at the theatre 30-minutes early Sunday through Thursday and 45-minutes early on Fridays to guarantee seating. This is a limited 2-day only sale that will expire at midnight on Thursday, February 24, 2011. Click here to buy now or for more information about the deal. Quantities are limited so don’t miss out! Limit 1 per person, may buy multiple as gifts. Limit 1 per visit. In-store only. Valid only for custom framing. Valid only at listed locations. Must use in 1 visit. Tax not included. Not valid with other offers. Today’s Groupon: for $45, you get $100 worth of custom framing at the Framing & Art Centre’s Maple Ridge, West Boulevard, or West Fourth Avenue locations. 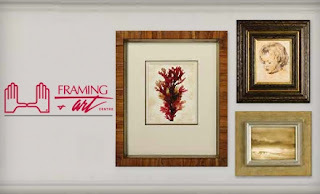 With thousands of frame and mat samples, Framing & Art Centre can satisfy any and all framing fantasies. The expert framespeople can make diplomas radiate (diploma framing starts at around $100), personalized jerseys glisten (starting around $300), and dorm-room movie posters sparkle (under $100 for 24″x36″ pieces). The design wizards can also find a home for any prized possession, such as shoe-box photos, baby booties, ticket stubs, medals, and really good pot roasts. Dropping an Etch-a-Sketch masterpiece can make any artist wish that he or she had properly preserved his or her artwork. With Framing & Art Centre’s diverse framing options, including acrylic cases for three-dimensional objects, artists can sleep easier, without fear of recurring night-haunties. For advice, the website offers tips and trends to help you choose, arrange, hang, and decorate everything, including the art, frame, mat, and glass. This is a limited 2-day only sale that will expire at midnight on Wednesday, February 23, 2011. Click here to buy now or for more information about the deal. Quantities are limited so don’t miss out! Limit 1 per person, may buy 2 additional as gifts. Limit 1 per table of 2, max 3 per table. Reservation required. Dine-in only. Not valid on 3/24/11. No cash back. Tax and gratuity not included. Not valid with other offers. 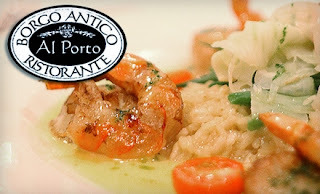 Today’s Groupon: for $20, you get $40 worth of Italian fare at Al Porto Ristorante in Gastown. A fanciful, haute cuisine haven, Al Porto whisks palates on a polished journey through traditional Italian fare amidst a warm, rustic interior. House specialties include wood-fired pizza prepped with in-house dough and tomato sauce, and bedecked with such flavour combinations as the Giovanni, with mozzarella, chicken, feta, pesto, and tomato ($10.95). Diners disdainful of discuses can opt for heartier dishes, such as the herb-dijon-encrusted lamb with rosemary demi sauce ($27.95) or the seared halibut with tarragon and lemon butter sauce ($23.95). Fortify your feast with an intoxicating moat—Al Porto’s offers a dizzying array of fine Italian and global wines. Otherwise, wrap up a meal in more style than Sofia Loren’s butler with such shareable desserts as the chocolate ganache torte ($6.95) or gelato freso ($6.95). The main dining room features mosaic tiles, terra cotta arches, and colourful murals of Tuscan pastoralia, well-suited for a romantic evening of eyelash fluttering and nostril wiggling. Regal recluses can also settle into the sunny, spacious loft, with elegant eggshell walls and a private bar. Situated near the waterfront, satiated saturnaliasts can meander through the surrounding environs for languid window-shopping or a romantic stroll through Portside Park. More than 70 OpenTable reviewers, more than 30 DineHere users, and more than 20 Yelpers give Al Porto Ristorante an average of 3.5 stars. Sixty-one per cent of more than 100 Urbanspooners recommend the restaurant. This is a limited 2-day only sale that will expire at midnight on Tuesday, February 22, 2011. Click here to buy now or for more information about the deal. Quantities are limited so don’t miss out! Limit 2 per person, may buy more as gifts. Limit 1 per visit. Reservation required 4 days in advance, subject to availability. 24hr cancellation notice required. Valid 10am – 6pm. May use toward upgrade. Valid only downtown (does not cross bridges). Gratuity not included. Not valid w/other offers. 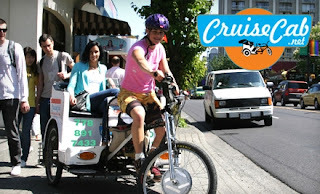 Today’s Groupon: for $25, you get a 30-minute daytime pedicab tour for two people in the downtown area from Cruise Cab (a $60 value). With a knowledgeable guide at the pedals of a bicycle-driven carraige, discover downtown Vancouver anew or for the first time without imposing emissions down Mother Nature’s esophagus. Choose your own entirely customized tour of the city centre or choose one of Cruise Cab’s popular preset paths within the downtown area (no bridge crossing included in this Groupon). As your brainy and fully licensed tour guide imparts information about the best local eateries, landmarks, and the mayor’s secret lasagna recipe, feel the breeze from the open carriage as well as inner warm-and-tinglies knowing your mode of transport is entirely emissions-free. Pedicabs operate in all weather conditions with full-canopy coverage for riders and the latest bicycle advancements to ensure safety, relaxation, and bike bragging rights. This is a limited 2-day only sale that will expire at midnight on Monday, February 21, 2011. Click here to buy now or for more information about the deal. Quantities are limited so don’t miss out! Limit 2 per person. In-store only. Not valid toward sale merchandise. No cash value. Not valid with other offers. 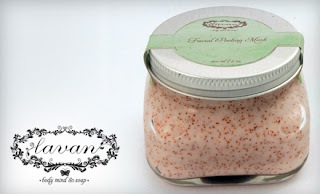 Today’s Groupon: for $12, you get $24 worth of natural bath, body, and facial products at Lavan, located downtown at the intersection of Granville and Robson Streets. Lavan’s products are made from natural Israeli ingredients, mixed according to ancient recipes, and packed in recyclable glass containers before being secreted into the recessed nooks and crannies of the company’s luxurious downtown store. Bottles of shower gel in six cheerful colours, their contents fortified with sweet-almond oil and minerals handplucked from the Dead Sea, unleash lavender, ginger-lemon, and other scent-infused thought bubbles when uncorked ($22). Lotion lovers can test out new tinctures at a central sink whose circular stone wall hosts tester items, such as a chamomile-infused hand softener ($25). Afterwards, shoppers can rinse hands beneath the sink’s four elegantly arched taps to erase evidence of fragrance experimentation and deter any feral daffodils they might greet on the street. This is a limited 3-day only sale that will expire at midnight on Monday, February 21, 2011. Click here to buy now or for more information about the deal. Quantities are limited so don’t miss out! Limit 1 per person, may buy multiple as gifts. No cash value. GST included. 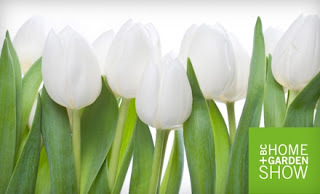 Today’s Groupon: for $15, you get two tickets to the BC Home + Garden Show (up to a $30 value including GST) at the Vancouver Convention Centre. This Groupon is good for entry throughout the run of the show, from Wednesday, March 2 through Sunday, March 6. Children 12 years old and under get in free. With more than 425 exhibitors, celebrity guests, and three stages of events and attractions, the BC Home + Garden Show quells decoration disquietude and home-repair rancour. The show, like a sole human at a stuffed-animal tea party, dutifully plays host to the latest product lines and features displays on interior design, renovation, and home entertainment. Bryan Baeumler, host of HGTV’s Disaster DIY, and a gaggle of other celebrity guests and local experts answer questions and lead seminars on the dos and don’ts of renovation, design trends for 2011, and programming homes to narrate apocalyptic sci-fi tales. After cutting a swath through the dense forest of gardening implements and vintage lamps, grant foraging feet a rest at the patio lounge. Parched gardeners can test their new watering cans with a cocktail upon the lounge’s artificial lawn, and appreciators of the fine art of crafting fine art can peruse the urban market, a gallery and shop displaying the fine arts, pottery, and sculpture of local and West Coast craftspeople. Though reviews for the BC Home + Garden Event are still growing, the national Home + Garden Events series has more than 3,200 Facebook fans. Today’s Groupon Deal of the Day: Laser Hair Removal at pHresh Spa + Wellness Club. Two Options Available. This is a limited 3-day only sale that will expire at midnight on Sunday, February 20, 2011. Click here to buy now or for more information about the deal. Quantities are limited so don’t miss out! Limit 2 per person, may buy 2 additional as gifts. Valid only for services purchased. By appointment only. All treatments are must be used on the same area. Limit 2 offers per area. Tax and gratuity not included. – For $150, you get three bikini-line or French laser hair-removal treatments (up to a $330 value). – For $99, you get three lip, chin, or underarm laser hair-removal treatments (up to a $237 value). The staff at pHresh Spa + Wellness Club heaps healthy spa services on Vancouverite visages. Laser hair removal toasts unruly hair roots into oblivion with the aid of a smooth jazz–gentle laser cadence, courtesy of IPL (Intense Pulsed Light) technology. The spa’s equipment efficiently flows photons across façades, allowing for a speedier silkening process. A special cooling process chills and soothes skin during treatment, saving clients the traditional postsession polar dip. Beach bunnies in need of defurring can achieve swim-trunk worthy contours by opting for a bikini or French treatment (a more comprehensive version of the bikini), and clients with undesirable above-torso feathers can zap away at lips, the chin, or underarms. Let go of fleeting Sasquatch lookalike contest daydreams and buy two Groupons for optimally smooth slates. This deal is valid for both new and current clients of pHresh Spa + Wellness Club. This is going to be a very hot seller so don’t miss out! This is a limited 1-day only sale that will expire tonight at midnight (Thursday, February 17, 2011). Click here to buy now or for more information about the deal. Quantities are limited so don’t miss out! Limit 1 per person, may buy 2 additional as gifts. Limit 1 per table. Dine-in only. Tax and gratuity not included. Not valid with other offers. 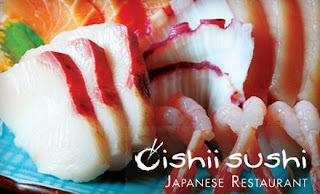 Today’s Groupon: for $15, you get $30 worth of sushi, sake, and more at Oishii Sushi, on Denman Street. An Ocean Wise honoree for committing to the health of oceanic ecosystems, Oishii Sushi rolls up fresh, distinctive sushi, robata, teriyaki, and more in a tasty mash-up of traditional Japanese and West Coast styles. Open mouths for the business of pleasure with appetizers such as the barbecue squid prepared on a robata charcoal grill ($8.95), or brightly flavored clams with garlic-butter sauce ($7.95). Prepared with Poseidon’s grandmother’s secret recipes, Oishii’s sushi is delicately rolled to showcase the ocean’s precious booty, as in the deluxe sushi combo (a dynamite roll and eight pieces of nigiri sushi, $18.95), or served in its purest form with the assorted 12-piece sashimi platter ($14.95). Cooked fare runs crispy with a variety of vegetarian and seafood tempuras ($5.95–$12.95), and salty-sweet teriyaki dishes ($8.95–$16.95) that necessitate a choice of vegetables or proteins, and the willpower to keep from bathing in them. Giving palates repetitive fresh starts, rivers of throat-warming sake are served by the glass ($5.95–$8.95) or bottle ($17.95–$36.95), in addition to a selection of red and white wines, beers, and more.